Just one of the cases on offer! Etsy is a haven for talented creative folk with a love of video games, with dozens of Nintendo crafts, toys and trinkets available. The latest motherlode of Nintendo-related goodness comes from crafty New Zealander Ki and his handmade 3DS cases. The cases come swathed in designs ranging from a cheery Shigeru Miyamoto to a stern Batman, with an extra pocket in there for carrying your AR cards too. If you like what you see on Ki's Etsy store, we've got an exclusive offer to net you 10% off anything. Simply enter the coupon code NINTENDOLIFE to get 10% knocked off the case of your choice. Your 3DS will thank you for it. I like the megaman and luigi cases, and $20 is a fair price for unique handmade cases. good stuff! 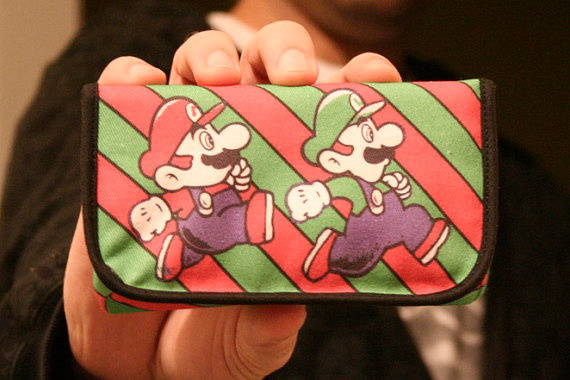 If I wasn't so cheap and didn't have two 3DS case-type things already, I would spring for the Link or the Luigi. And of course the M&L with the caption is sweet. Oh, wow. These are awesome! I really like the Mega Man and Kid Icarus cases. I especially like how the Kid Icarus case has 8-bit images of Pit and The Eggplant Wizard when you open it. So cool! I dont have a 3DS but I am half tempted to get one and see if it will fit my DSlite. Megaman and Kid Icarus ones look awesome! The Link and Dk ones look awesome. I want the pokeball one. Thanks Nintendo life might pick one up now. Even though I already have one, I like the Kid Icarus, Pokeball and Link ones. Wait how much does the 10% take off on the 20 dollar cases? sorry, i already made mine some months ago. >cries in a corner because his handmade case looks horrible. 10% off $20 equals a total of you having to pay $18 instead of the normal price. EDIT: $18 plus shipping and handling, unless if the shipping and handling is included in the $18 price or there isn't any, which I doubt. These cases are awesome. When I get around to buying a 3DS ill be picking one of these up for sure. @ryanthehedgehog: Sweet. I didnt get a chance to read about them yet. Thats good to know that they will fit DSlite. Now I biggest problem is which one would I want. The Mario and Luigi one that's shown above looks very cool! Hey these are my cases and I'd like to say thanks for all the praise you guys have given them. Also lets address so questions you guys and gals seem to have. @Tasuki These cases will fit your DS Lite and DSi perfectly. They size difference between these 3 handhelds are millimeters which means they all fit snugly into the cases. Trust me I've tried them all personally. In the forums some have asked about how protective they are. These cases are made to be slim and allow you to keep your 3DS/DSi/DSlite in your pocket with the case on. It will protect your case from scratches if you put your case in your purse, backpack etc. but not from a fall from a reasonable height. Also just to let you know. I am from New Zealand but not Wellington like the article suggests. I'm from quake stricken Christchurch. My girlfriend and I both lost our jobs because of the quake in Feb this year. We started making these cases to pay the bills. Since then we have both gotten new jobs, but had such great response from gamers about our cases that we continue to make them. Cool designs, but one thing comes to mind for me. Can individual sellers really sell their home made products emblazoned with copyrighted images? Don't they need to have them officially licensed first? Is that really an okay thing to do or is this an until they get shut down sorta thing. Anyways, those are some sweet looking designs. I wish they'd have these on Club Nintendo instead of...what they have on there now. I especially like the Goomba case. Glad to hear you're getting back on your feet in Christchurch, Ki. I'll take over 9000 plz. Wednesday, I'll order the pokeball one. I wish there were a legend of zelda themed one! I want the animal crossing one! They look AMAZING! There were more than twice as many when I checked this store out earlier. These are sexist! Where is mah purty princess Peach pouch? There are more cases. I just need to have time to put them up on the site once one sells. Thanks again to all that are purchasing. My girlfriend and I are working hard to get them made and shipped as fast as possible, but due to 20+ cases being sold today (Thanks NintendoLife!) it will take a few days to get them all made and sent. Each case takes a little over an hour to make, so thanks in advance for your patience! @whataboutki great job on these, they look really good, sorry about the mountain of orders! I was joking about my purty pink princess peach pouch whataboutki. They do look nice in all seriousness. You said you plan on making new ones? It's time like these that I wish I had an ounce of artistic ability. I might pick up that brick one! Nice job, whataboutki! Well done KI on getting your story over here on NL, looks like you and I managed to spread the word on the cases well! Hope you continue to get lots of orders! just bought the pikmin one, now all i need is a 3ds pikmin game to go with it! Hey everyone thanks again for the purchases. For anyone still looking I've just restocked the Etsy store plus added a great Pikachu case and Nes Controller case! Wow. These are just so . I can guarantee that I'll buy one when I get a 3ds in october!!! Please! I hope you don't stop making them by then!!! The donkey kong one, aswell as the mario one with the art from the RPGs look really amazing! You sir, have stylistic choices in colors and design!